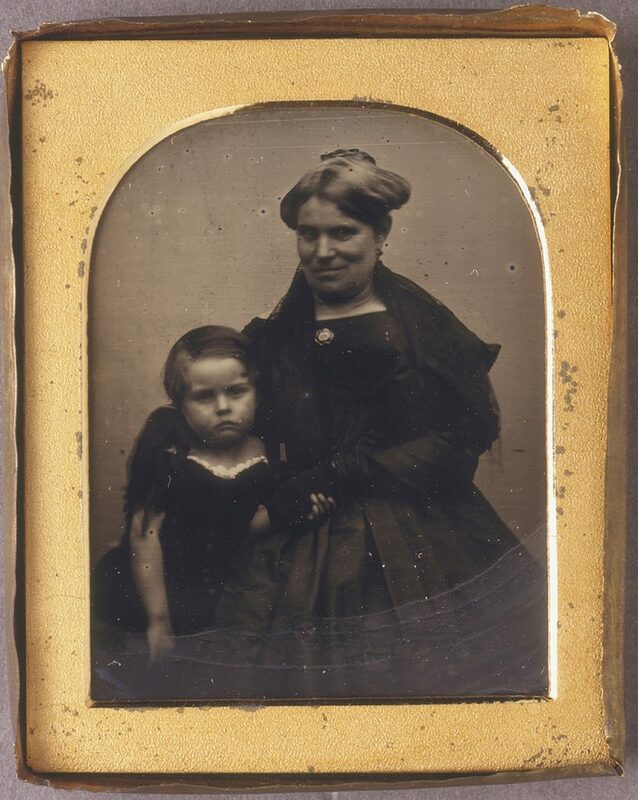 This ¾ length daguerreotype portrait shows Caroline Lawson, aged 43, smiling somewhat uncertainly into the camera as she stands with her right arm wrapped around the shoulders of her youngest son, Thomas James, aged 3½, holding him close by her side to minimise movement and subsequent blurring of the image during its lengthy exposure. Mrs Lawson wears a dark-coloured [woollen] dress with a moderately high, shallow neckline cut wide across the shoulders, draped in a black lace shawl above long narrow-fitting sleeves trimmed below the elbow with small, bell-shaped oversleeves and worn with wrist-length black gloves. The tightly-fitted bodice is pinned with a gold and black enamel mourning brooch, probably housing a sample of woven hair, above a central braid-trimmed ‘plastron’ (v-shaped) panel with a ruffled flounce extending over the shoulders, and a full skirt pleated into a pointed waistline. Caroline wears her long, greying blonde hair centre-parted, arranged in a pair of lobed rolls set high over her ears, fitted with black-enamelled earrings, the remainder of her hair pinned up in a plaited and coiled bun on the crown of her head. Thomas wears a full-skirted, short-sleeved, dark-coloured dress. Typical attire for children of both sexes during toilet training years, before boys were breeched at the age of 5-6 years, it is cut wide across the shoulders, leaving his white undergarment visible at the neckline. His short blonde hair has been brushed into a side parting, a useful indicator of his gender, in this era when all girls wore their hair with a centre parting. The Lawson’s had recently borne the loss of two infant children – a 16-month-old daughter Frances, known as ‘Fanny’ (April 1843- Aug 1844), and Charles Samuel (1844-Dec 1844) – which may explain the dark, sombre appearance of this portrait commissioned by grieving parents anxious for an image with their youngest surviving child. Born on 23d September, Thomas James (1841-1877) was the second son of William Lawson, the younger (1804-1861) and his wife Caroline Icely Lawson (1802-1875) who had married in 1832. The couple had 10 children (5 daughters and 5 sons). In April and May of 1845, at the request of 100 subscribers, photographer George Goodman had travelled to Bathurst, NSW, where he spent three weeks at the Victoria Hotel taking daguerreotypes. On the way back to Sydney, in May 1845, Goodman took a series of photographs of the William Lawson family, probably made at their property ‘Veteran Hall’ in Prospect, NSW, producing a suite of exquisite daguerreotype portraits, six of which survive in the Mitchell Library.